Baroque music is characterized by a certain as spirit of theatricalism, or grandiose concepts, and by a rather heavy elaboration of design and magnificence of effect. Harmony: Became diatonic rather than modal. Made use of chromatic or altered tones. Chord progressions became important. The harmonic or vertical approach to music tended to overshadow the older contrapuntal or horizontal approach. An important harmonic innovation was the figured bass where the numbers under the bass part indicated the chords to be played by a keyboard instrument. Rhythm: Rhythms developed to become quite complex. Time signatures often used 4/2, 2/2, etc. but all time signatures were common. Phrasing was often long and irregular. Rhythms mostly metrical, but some syncopation was used. Many repetitive patterns including ostinato patterns. Texture: Complex polyphonic textures developed even further from the earlier periods. Homophonic textures developed in this period and became more prominent than polyphonic. 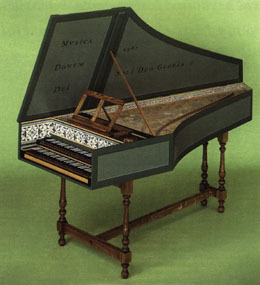 Instrumentation: Harpsichord (pictured above), clavichord, pipe organ, violin family (beginning to replace older viols) and strings. Oboe and bassoon, flute and sometimes recorder, no clarinets, French horn, sometimes trumpet (natural harmonics only), trombones, and of course, voices. A common combination was the Basso Continuo where a keyboard instrument played chords from a figured bass along with the bass instrument. The crumhorn is a wind instrument with a double reed. Dynamics: Usually ranged from pianissimo to fortissimo with no gradual increases or decreases. Use of terraced dynamics was common. Formal Structures: Dance Suite, Prelude and Fugue, Concerto Grosso, Solo Concerto, Oratorio, Cantata, Solo Sonata, Trio Sonata, Overture, Opera (see section on Baroque Forms). Dance Suite: This form was used as a Harpsichord Suite or as an Orchestral Suite. It consisted of four standard dances: allemande, courante, sarabande, and gigue. Various optional dances are sometimes added as well as a overture (prelude, sinfonia). Allemande- moderately fast in duple time with an anacrusis. Binary form. German origin. Courante- Fast triple time (combination of 3/2 and 6/4 meter) with an anacrusis. Frequent dotted rhythms. Binary form. French and Italian origins. Sarabande- Slow movement in triple time. Makes use of dotted rhythms and many ornaments. Binary form. Spanish origin. Gigue- Lively 6/8 or 9/8 time and in fugal style (making use of imitation). Often the second half theme is an inversion of the opening theme. Fugue: A complex polyphonic form where a theme or subject enters first on one instrument or voice, then enters in a slightly varied form (answer) whilst the first subject continues. This overlapping continues until all parts have entered, creating an interweaving effect of the same and similar melodies. Sometimes a different section appears (episode) before the parts re-enter, often in a different order. A stretto is where the parts begin overlapping a lot sooner. A double fugue uses two different subjects. A countersubject is where the subject continues against the entry of the answer. Solo Concerto: Music for orchestra with one or two solo instruments, usually violins. The solo instrument is more prominently featured than in the Concerto Grosso. Tends to be more homophonic in texture. Oratorio: A dramatic production on a large scale, usually dealing with a Biblical subject, and produced without staging, costuming or scenery. Oratorio makes use of a narrator, vocal soloists, chorus and orchestra. The forms used in oratorio are overture, recitative, aria, and diverse choral ensembles. Cantata: Similar to the oratorio except that it is a short, lyrical form. It deals with varied subject matter, either religious or secular. Cantatas are written for a small number of performers. Solo Sonata: A composition of several movements for a solo instrument (mostly violin), usually with a figured bass accompaniment. Trio Sonata: Written for two solo instruments, and a basso continui part, usually two violins, cello and harpsichord. Overture: The Italian sinfonia and the French Overture became important orchestral forms in the late Baroque era. The Italian sinfonia had three sections: fast (with strong rhythm), slow (in chordal style), and fast (usually dance-like). The French overture also had three sections: slow (dotted rhythms), fast (lively and fugal), slow (often the same as the first). Opera: A dramatic production produced with staging, costume and scenery. Performers include vocal soloists, chorus and orchestra. The forms used in opera include overture, recitative, aria, and diverse vocal ensembles, including chorus.